Why can’t we leave food well enough alone, so that we might taste an apple when we bite into it, not a juicy orb of cardboard. Or, heaven forbid our food product not be stable enough to sustain a lifespan of 100 years (ummcoughtwinkies). Eat real food, people… Once a week, Learn to make a childhood favorite with your family, or for your family! Place hazelnuts in food processor or high-powered blender. Blend until smooth, scraping down the sides as needed. Sometimes they have more oil and it comes together quickly. Once the hazelnuts turn into a buttery consistency, add the honey or sugar, vanilla, salt, and cocoa powder and blend until smooth. Slowly add the milk until you reach your desired consistency. 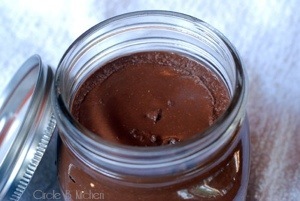 Note: the primal recipe can be found at fellow blogger – all sorts of pretty.